This is one of the survey results included in The Aberdeen Report “The Value of Strategic Supplier Data Management”, which is based on a recent survey among supply chain and sourcing practitioners and is filled with valuable data about what separates the Leaders from the Followers. 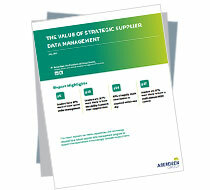 This report can help you evaluate your own supply chain management maturity and identify where you should prioritize your efforts in developing your supplier information management strategy. Which capabilities and technology do Leaders have in place to drive superior supply chain performance? How do Leaders leverage supplier information management to streamline their supply chain processes? Thank you for your interest in Informatica. Please complete the below to have this item emailed to you.